Quite a stage. Go on Froomey win all three! OK, actually it'd be good if Dumoulin won Le Tour. Tomorrow's a biggy. You can achieve anything with a combination of the right pillows and beetroot juice. Is this from the advice section in Cosmopolitan? So Dumoulin falls because of Reichenbach? 3 minutes slower than Santambrogio and Nibali in 2014, in far worse weather conditions. Santambrogio! I'd forgotten all about him. ISTR that was the year he suddenly started winning everything in sight, and was making everyone else at the Giro look slow... Everyone was soooooo surprised when he got busted. Wasn't he a team-mate of 'Killer' Di Luca? They were a rum bunch and no mistake. I'm sure I heard the commentator refering to Ron Dennis and Pots of Evil. I definitely heard Ron Dennis mentioned, although Sean Kelly always calls him Ronan Dennis. Kelly also seems to think Yates rides for Michelin-Scott (formerly Ulrika-Greenedge). Wow, I thought Morzine was the most impressive bit of bike racing in the last 20 years but that beats it. Landis succeeded because no-one thought he'd make it, I reckon TD thought the same on the descent. To quote Greg Lemond "unbelievable", but bugger me it was entertaining. In his excitement at one point yesterday Kelly mentioned the group of Pozzitivo. Anyway, dodgy Froome apart it's been an exciting race. 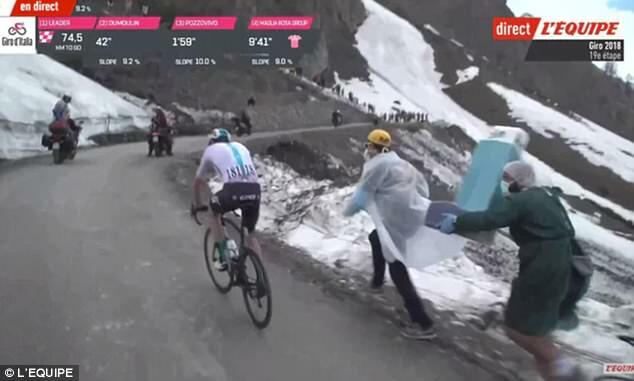 And it's not over, Froome burnt a lot of matches yesterday and today the boot will probably be on the other foot. Dumoulin's team will be putting on the Pain. Yates? Didn't conserve his energy. Inexperience. But he is a future GT contender. Thursday was where it all fell apart and the other teams noticed. Ron Dennis seems to crop up every couple of days, very distracting! You can rely on King Kelly. BTW who is the current "kin kelly" I keep hearing references to ? Possibly team staff? Or an Italian rider not picked for the Giro? Yes, agree with all that. They've put a lot of effort into that, good work! He blew a lot of energy doing a few things he didn't need to do. You know from your own riding that you can only go into the red so many times. He's had a great ride...he'll come back and win it sometime. It was the TT that killed him, but it kept him in pink for a few more days. My homework at the time found Biff sotp did the Reichenbach Falls gag for the 2013 WOrlds. Froome burnt a lot of matches but only the same amount as Dumoulin did to keep it to 40 seconds. Dumoulin towed 4 other riders for a third of the stage and looked cooked at the finish. It was actually quite an unbelievable ride from Dumoulin as well. I'll take the result at face value and let the authorities deal with any doping issues. 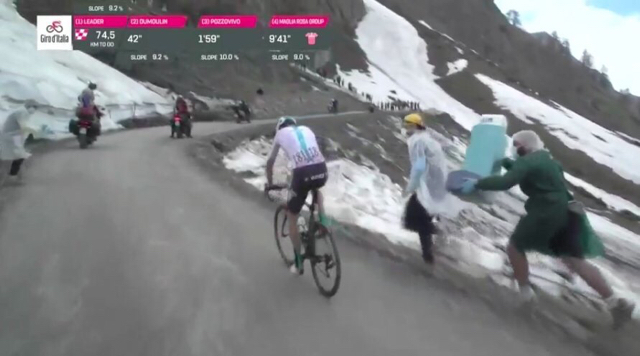 It was an amazing stage to watch live and, drugs or no drugs, it was still an historic 80km solo time-trial by Froome. Disclaimer to avoid any misinterpretation: this is not an insinuation, but a way to express the admiration for an exceptional achievement. Congratulations to Chris Froome and Team Sky. It's a circus. It'd be great if everybody would accept that. It's like watching a film....suspension of disbelief is required. I'll take the result at face value and let the authorities deal with any doping issues. But the authorities secretly dealt out the dope, legally all within the rules to the favoured rider(s) of course! Look, this is simple. The reputation of professional cycling is shot. Nobody can do anything special without the spectre of doping hanging over them. I think it's irretrievably damaged actually. Other sports just don't dig deep enough into doping* (presumably to stop their sport's reputation ending up the same way). You either watch it, enjoy the special moments, and let the authorities deal with the rules, for better or for worse, or don't watch it. I don't see any point in continually watching it and continually bitching about it. Or....has "guess the doper" become an intrinsic part of the enjoyment now? It seems that, for some, enjoyment of pro cycling is inversely proportional to the performance of the top cyclists. The more special the moment the more cynical, and miserable, the experience of the viewer. *Jamaican sprint program. Kenyan/Ethiopian long-distance. Football, even Snooker FFS, etc etc. I have a feeling that, if they spot-checked every professional sports person right now, a high percentage would be caught with something dodgy coursing through their veins.